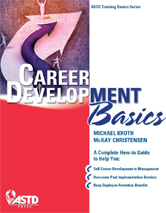 Career Development Basics arms learning professionals with the tools to uncover hidden talent, retain high-performing employees, and grow mutually-beneficial, thriving employee/employer relationships. 1. Career Development: Whose Responsibility Is It?